Google’s social networking initiatives seem to be in a complete free–fall and now the killer nail in the coffin could has been hit. Orkut which has always been successful only in the Indian and Brazilian markets, had over the past year or so stagnated in its growth. According to latest figures (July 2010) by the comScore report, Facebook has finally surpassed Orkut to become the number 1 social networking site in India. According to the survey, Facebook is the top most social networking site in terms of numbers (20.9 million) in July, a growth of 179% over the previous year. 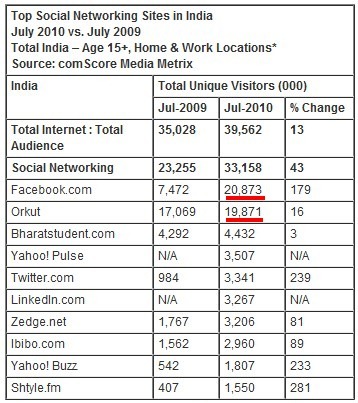 Orkut is ranked second (19.9 million) visitors with a growth of just 16%. Twitter has the highest growth among the top five social networking sites (239%). Interestingly both the social networking sites of Yahoo are present in the top 10. But now the main question now is – Does this signal the beginning of the end of Orkut? Google tried developing some new applications and copying quite a few features of Facebook onto Orkut to revive it. But after these attempts failed, it just left the whole idea of saving it completely. Google has already left Orkut to die a slow death as is shown by its attempts on acquiring every company left, right and center to enter the social media domain. However, there is slight ray of hope for Google – Google Me – I think Google’s future in Social Media space will be decided by this soon-to-be-launched Social Media platform. Orkut has reached the decline stage; Facebook is reaching the saturation stage while Twitter is in the growth stage. If u have noticed the technology with which they(fb,twttr) drive these social websites is the same – Web 2.0 – the design has been changed frequently – so i would like to see open source coming into play where people can set up their own ways of communicating things . e.g a nature lover would speak more by photos(flickr) – so more visual items – the websites could look differently to different users – something like the theme you choose for your Orkut – I think this is where the social media will arrive at …..
@Madhav – I myself found FB too complicated initially. But with time it seemed a better option. I am sure soon something else will come and people will move on. Yesterday I was reading an interesting article on social media burnout as to how people are constantly online and have shifted to a virtual life rather than reality. Good analogy! Innovation needs to happen especially in technology. If Coach or Louis Vuitton stop producing new designs, nobody will by the bags they produced 5-10yrs ago! I thought FB was too complicated for non-geeks and will never gain traction in India- I was totally wrong. I am an NRI living in Tokyo. I can state that my wife and all her friends are on FB atleast for 1hr everyday. In fact, my wife teaches me how to use FB. So, it not that Orkut is not used, but its just bit dust out of negligence from Google, and not because of its users moving base. I will be interested to read some articles comparing other soc-nets in India like Ibibo, Bigadda, Hi5 etc. PS: I found this post and comments to be relevant to this post – http://devilsworkshop.org/top-10-social-networking-sites-in-india/ You can see how people had perceptions similar to mine, but must be eating their own words (like me!). Going by the axiom of “Online Media today is an ever changing concept”, Can we predict the death of facebook which as you mentioned is in saturation stage ? Or Is Facebook the last word in Social Networking ? What do you guys think ? After Facebook too there will be something else. The World Wide Web is a continously evolving field and truthfully speaking no one can say what is the last thing in this field. Facebook is reaching the saturation stage and not that it has reached already. Yeah the kind of following Facebook has gotten all over the world is itself something to be studied really well. I am sure Google wont take this failures lying down and would surely fight back. But the question lies on how much its initiatives are successful. As Yaamini rightly pointed out it is because of the applications that has made facebook what it is today. ease of usage is another thing that made it more popular. one can share the youtube video or flicker photos what ever with ease. Has anybody noticed? that on most of the sites there is a facebook recommendation or like button, there is a twitter button as well but u will never find the orkut button!! Google has understood where they are lagging and is already trying to take some share in zenga! creators of farmville and cafeworld. it will be really exciting to watch what happens next. Orkut was never a great product. And Google never focused on it. Initial adoption to Orkut was a result of Indian users unaware of FB or MySpace. But due to great word of mouth publicity FB took over Orkut, and as more and more people joined Facebook, Orkut started looking a old chap with nothing fresh or competitive to offer! Completely agree. It was the first one to catch the fancy of Indians and thus conquered their minds completely. Facebook has definitely reached the top today . Its so much more cooler , easier has so many more applications than orkut. Todays youngsters including me prefer Facebook to Orkut. Orkut did try to copy Facebook in many ways but seriously Orkut has lost its charm. There are millions of people today who are opening Facebook accounts rather than Orkut. I agree that Orkut has definitely reached the decline stage. Orkut did just one mistake which completely destroyed it. It could never INNOVATE!